Jaymi Hensley and Olly Marmon Fanfic Part 1! Disclaimer: I don’t know Union J. What I’m writing is complete fiction. Time to act. Time to put on a brave face and pretend everything is absolutely fine. “Yeah. I’m totally fine Josh.”, he calls back getting up from the bed and going to answer the door. “Hey, come on in.”, he says letting Josh in. “Oh that’s good then. And you stayed in your hotel room alone doing what?”, Josh says with a cheeky wink. Jaymi smiles and blushes before changing the subject. But it only made Jaymi feel worse. Olly had stood by him when he was a struggling singer trying to make it and now not long into their career he was considering breaking up with him. It felt to him like those popstars who had long-term partners and split up with them when fame beckoned and he had always swore that he would never do that to Olly. Never felt he’d ever need to. Never thought he’d ever feel the way he was feeling now. He has fell into his own thoughts again and Josh’s voice alerts him back to reality. Josh looks concerned and Jaymi knows he has to change the subject before he is caught on to and he doesn’t want to have this conversation with Josh or anyone. He wants to put on a brave front and handle the situation himself. “Yeah. So JJ should be back soon with some food. He said he might pop into the take-away on the way back if it was open but I don’t think it’ll be open. I mean it was closed this time yesterday but maybe the times are different for today …”, he is speaking quickly and Josh stops him. “Of course we are! Why wouldn’t we be? !”, he reacts defensively. The door clicks open and JJ comes in carrying two take-aways and a plastic bag filled with groceries. Jaymi’s mobile phone rings. He stands rooted to the spot. The ringing getting more and more painful to his ears. “Well aren’t you going to answer that mate?”, JJ asks. “Oh for crying out loud! Will that ever stop? !”, Jaymi says picking up the phone and putting it off. “What’s wrong? Has he done something wrong? Because if he has …”, JJ begins. Olly sat in the kitchen area of the hair salon and placed his mobile phone on the kitchen counter. Why on earth was he not answering?, he thought. Had something happened to him?, he thought but quickly pushed that out of his head. It wasn’t like he was blind to the facts. The more time that they were spending apart the more they were growing further and further apart. He knew he was holding on out of a sense of loyalty, duty and because he loved Jaymi still as a person and didn’t want to hurt him. And yet he wasn’t sure that he was in love with him anymore. He picked up his cup of tea and took a sip. The warm liquid flowed through him but unlike the comforting feeling that warm tea gave one it couldn’t comfort him. Not in this situation. Not now. Jaymi reached a park bench and sat down. Further guilt immensed him. Olly might be worried sick about him. He took the phone from his trouser pocket and turned it on. Two missed calls. He knew he had to call Olly but as he searched for his name in his contacts list his hands began to shake and he dropped the phone. He breathed in and out and tried to compose himself. Come on Jaymi, pull yourself together. You’ve rang this number a million times before, he told himself and picked up his mobile phone. He breathed deeply and rang Olly. The dialling tone rang and rang and it was the most scary few seconds of his life. Finally Olly answered. He sounded tense but Jaymi chose to ignore this. He was tense himself. “Yeah, of course. Why wouldn’t you?”, Jaymi joked but even as he was he could see his free hand shaking. There was silence for a few moments that felt more like an eternity for both of them before Jaymi broke the silence. Jaymi ended the call and looked out into space. How would this all play out?, he feared. He was scared. This was too important to end badly. It had to end as well as it could. He knew that he had to handle this well but he didn’t trust himself to do so. Back at the hotel, George had now joined JJ and Josh in JJ’s and Jaymi’s hotel room. “He’s acting weird George. Going on about been curious about what been single is like and saying that Olly doesn’t own him. JJ never said he did.”, Josh explained. “Oh JJ you don’t say.”, Josh said. “He shouldn’t. Olly is a great guy.”, George said. “But if he isn’t happy …”, JJ began. “Stop. We can’t let him make the biggest mistake of his life. He’d regret it!”, Josh protested. “Don’t get me wrong. I love Olly. He’s amazing and he’s a mate of mine but Jaymi’s one of my best friends. I will stand by whatever his decision is.”, JJ said. “What’s got into him though? It’s ridiculous. Most people want what he has and here he is about to throw it all away.”, Josh replied. JJ was watching TV while sitting on his bed when Jaymi came back in. “Don’t mention it. It’s absolutely fine Jaymi.”, JJ said with a wave of his hand. “No. Why would I?”, Jaymi asked defensively. Jaymi sighed and sat on his own bed. “I’d gathered that much.”, JJ smiled. “You’re not an awful person Jaymi. Everything will be alright.”, JJ said and gave Jaymi a hug. Lady Gaga Speaks About Her Love For Taylor Kinney! Lady Gaga gets a piggybank from her handsome hunk Taylor Kinney! I love Lady Gaga and her relationship with Taylor Kinney and it is always nice to hear a bit of celebrity romance news so I found it ever so cute when she recently spoke about finding love with the handsome actor and model. Speaking to Fashion magazine she revealed that her relationship with Kinney is real love. Aw! She also revealed that she “didn’t feel alive unless I was on a stage”. I am so happy that they have both found each other. It is hard to find that special someone and as a fan of both of them I’m happy that they found each other. So sweet! I’ve never wanted to be a sofa so much in all my life! This week I have decided to review the debut album by Union J entitled, Union J (Deluxe Edition). I was so excited to hear the album and it didn’t disappoint. So let’s review it song by song. Here goes! Carry You: Carry You was of course the debut song by the boys and it’s brilliant. It’s catchy, upbeat and not really what you would have expected that they would release for their first single but I’m loving the unconventionality! Jaymi’s voice sounds amazing on both this and the acoustic version which appears later in the album. Beautiful Life: Beautiful Life was their second single and it wrote by a beautiful man in Nathan Skyes so the title is quite apt. It’s an uplifting ballad with a back story of not worrying if you’re life is more lived through magazines and all your friends are in magazines and that you can make your own reality. It’s kind of inventive Mr. Skyes in a world awash with songs about either love or partying on a Saturday night which are fab but this is fab too. I love JJ’s solo in it. Loving You Is Easy: This song is their third single and it is written by Jason Derulo. If I didn’t know which song he had wrote I probably wouldn’t have known it was this song. It’s a very good song but it doesn’t sound very Jason Derulo which I’d imagine is what he was going for. I suppose when you’re writing a song for another act you do want it to be more them than you and he found that balance. Josh sounds really amazing on this song. He has a lot of hard notes in it. Last Goodbye: To be honest this is one of the songs I don’t listen to as much on the album. Of course the lines about leaving a light on and about not been alone tonight send a message to the old ovaries but I don’t love it as a song. 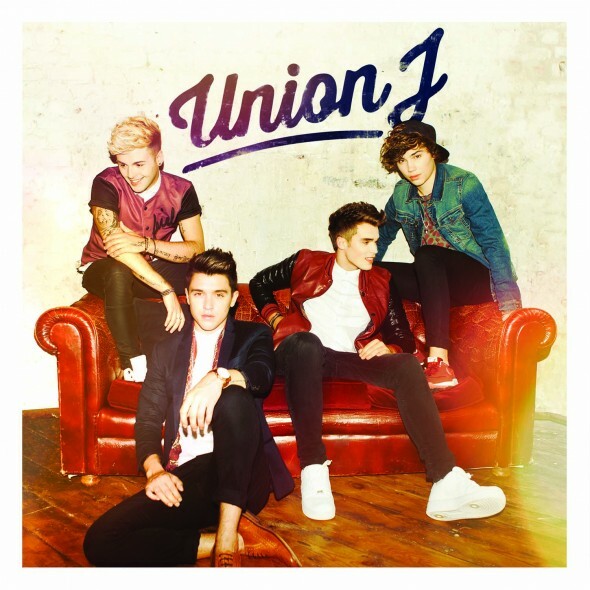 Beethoven: Beethoven is my favourite song by Union J and it is really good on the album but I do prefer the acoustic version which you can find on YouTube. I love this song because as well as pop music I love rock music and while this is essentially a pop song it has an edge to it that is quite rocky. George’s voice lends really well to it because he has the edgiest voice in the band. Josh starts the song well. JJ compliments the other lads well throughout. Jaymi is also amazing on it and singing about “tasting sandalwood on your skin. When it ends I only want to start again.” Really?! What exactly is he trying to do to men and women out there?! Just wait while I control my ovaries! It’s a perfect song in more ways than one! Head In The Clouds: JJ previously described this as a “curveball” and I’m all for one throwing the odd curveball in but it’s not the best song in the world in my opinion. This song and the acoustic version which I’ll talk about later are the songs I don’t like the most on the album. It’s a song you wouldn’t expect from Union J and to be fair they have a lot of them on the album in Carry You, Loving You Is Easy, Beethoven and Lucky Ones which are fantastic and I love when people do things a bit different but their good different. This isn’t good different in my opinionWhere Are You Now: This is a really good song. I can relate to the lyrics due to an experience in my life. I love the song but sometimes I feel like crying because it reminds me a lot of someone who meant a lot to me but that’s a good thing because songs are supposed to emotionally touch you. I just pick my moment to listen to it! Save The Last Dance For Me: This is your song to dance to. It’s upbeat and it’s a really good song. I don’t even want to count the amount of times I’ve danced to it because I haven’t got all day to! It’s an awful lot of times. It’s perfect for a club. And it reminds me of a club, pub or party atmosphere. It reminds me of times I’ve been out and had a vodka too many. Although I must admit no one was revolving around me and I certainly wasn’t getting my drinks for free! Amaze Me: This is a stunning ballad which really showcases Jaymi’s voice in such a beautiful light. It is scary how good of a singer he is. His voice adds such depth to the song. It’s beautiful. It’d be great in a movie. It’s really romantic and about been still amazed by someone you’re a long time with and I’m sure it was very easy for Jaymi to sing because he’s in a long-term relationship with his fiance Olly. Skyscraper: This would have been their winners’ single if they had won The X Factor. It’s a cover of Demi Lovato’s Skyscraper and I’m glad it got included on the album because it is a stunning version. Actually I heard both theirs and Chris’s winners’ singles. (Chris’s was going to be The Reason by) And I preferred both their songs. It’s a pity we didn’t get to hear them both on the final going head-to-head for the title but at least we heard them after. And they were worth the wait. Carry You (Acoustic Version): Oh my! This is beautiful. It’s so well crafted. It’s stunning. Yes, Carry You definitely works slowed down. Jaymi as I previously mentioned sounds amazing on it but to be fair that boy could probably sing the phonebook and it would be outstanding. The way he constantly just hits really hard notes, I’m in awe as someone who would love to be a singer myself. In awe. Defo. Head In The Clouds (Acoustic): It’s no better acoustic. Sorry boys! Where Are You Now (Acoustic): The acoustic version of this is beautiful. It’s a stunningly well-crafted song and it works acoustically or not. Love it and I’m looking forward to it on the tour because it’s supposed to be done really well. Lucky Ones: I can relate to this song too because I am a geek and it is pretty much a celebration of been a geek or an inbetweener and taking pride in that. With two self-confessed geeks in the band it’s not a surprising choice and in a world obessed by cooldom it’s always great to see geekiness shining in any medium. It’s a really good song too. A good one to dance to. In other news they look absolutely beautiful on the cover. Do they ever look anything else but handsome though? And I think Jaymi’s dedication to Olly is dead cute while I smile at his dedication to Beyonce and go too true to his dedication to the fans. It reminds me of a quote Mark Feehily from Westlife said on an album years ago. (Now I’m really showing my age! And how long I’ve loved boybands for!) Very wise words gents. Inspirational really. Crimbo Jumpers From Funky Christmas Jumpers! The truth is Crimbo jumpers make us smile from a Santa to a snowman to a reindeer and all the various wonderful alternatives. And who can forget the beautiful Colin Firth’s (Yes I know he’s quite a bit older than me but come on, he is too beautiful!) 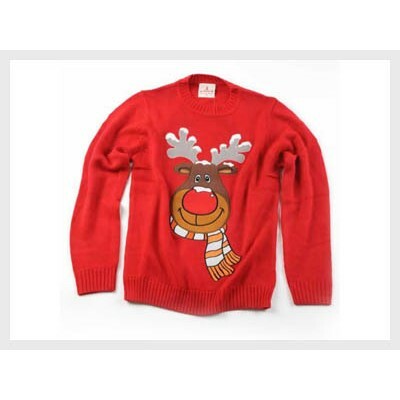 Christmas jumper in the film Bridget Jones Diary when Bridget first meets his character Mark Darcy? So with Christmas well and truly on the way let’s talk Christmas jumpers! 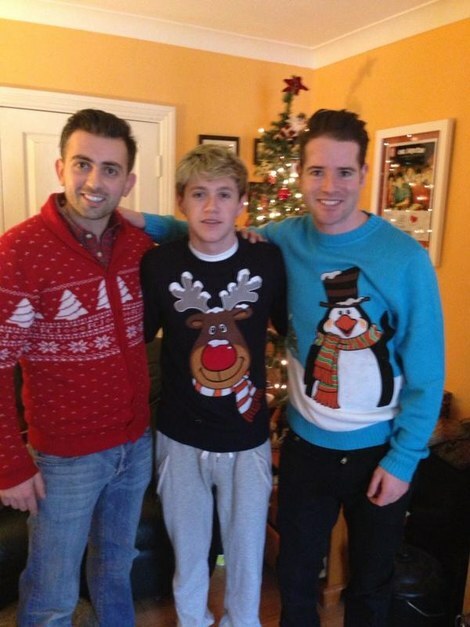 I feel that the fantastic jumpers from Irish site funkychristmasjumpers.com are amazing. 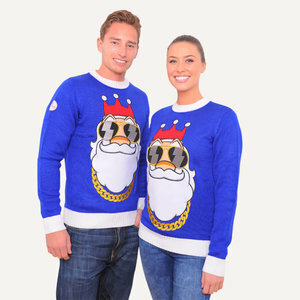 There is many fun options such as the uniquely fabulous Bling Santa which is unisex. The company creates jumpers for men, women and kids so why not check out the jumpers available and see if you would like to purchase any. 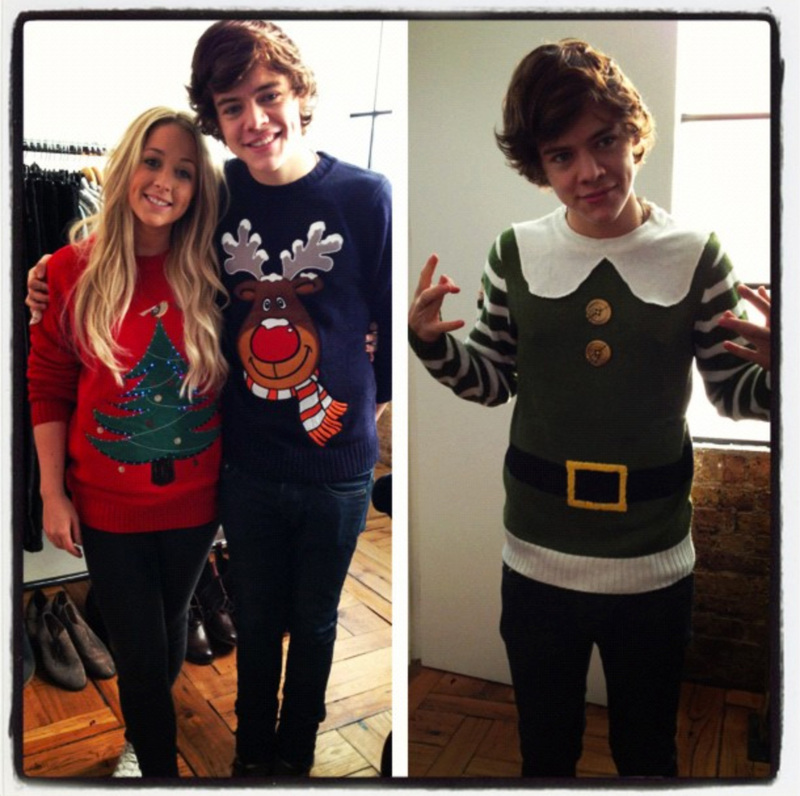 One Direction members Niall and Harry have also wore them with our Niall going for a reindeer while Harry wore both the reindeer option and an elf-style piece. Other celebs who have wore them are Scott Disick, Deric Hartigan and Chris Tarrant and other celebs including our own Kian Egan wore them on the recent charity version of Who Wants To Be A Millionaire? (Yes, I do, I do!) So like the celebs get in on the fun! You know you want to! 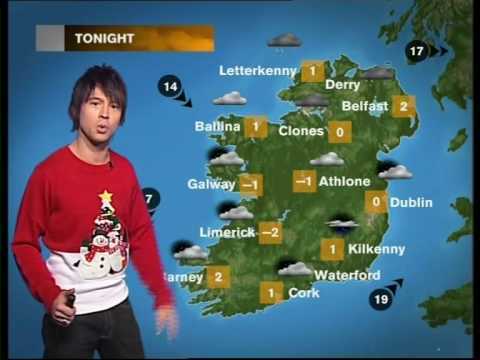 Weatherman Deric Hartigan sports a jumper! 1D’s Harry has given the company the thumbs up! 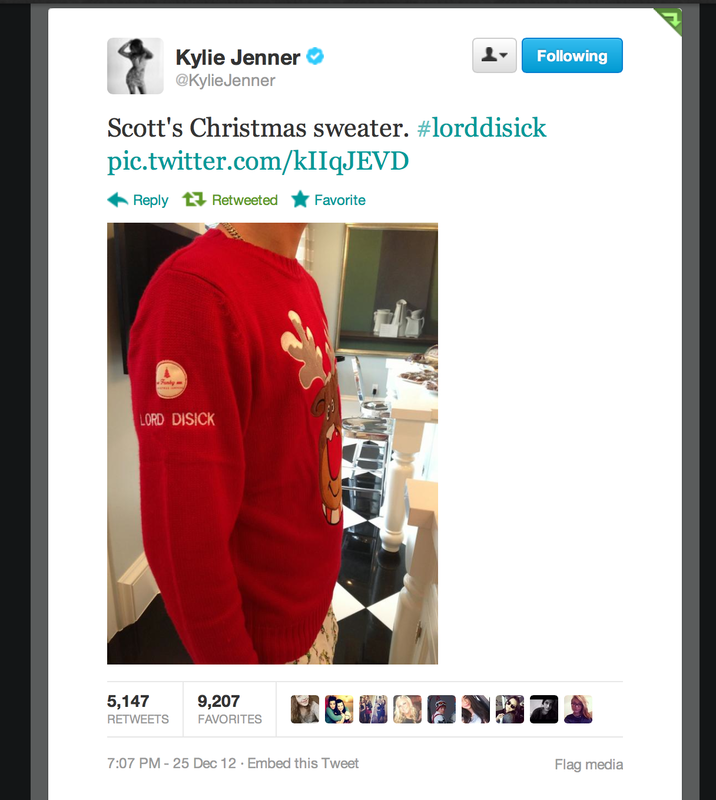 The fit Scott Disick in a cool jumper from the brand! 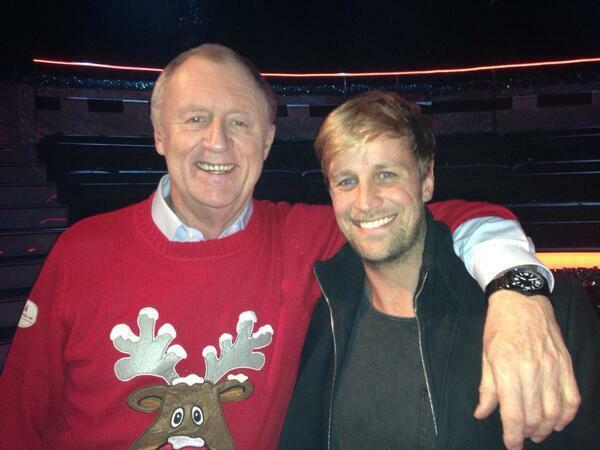 Chris Tarrant sports a jumper from the brand while other celebs such as Kian Egan wore them on the recent charity version of Who Wants To Be A Millionaire? Leave a comment Posted in Fashion Tagged Bridget Jones Diary, Chris Tarrant, Christmas Jumpers, Colin Firth, Deric Hartigan, Funky Christmas Jumpers, Harry Styles, Kian Egan, Niall Horan, One Direction, Scott Disick, Who Wants To Be A Millionaire? Jaymi Hensley, Olly Marmon and Belle Fanfic! Little Belle with both Jaymi and Olly. He smiles and tells me gently to stop barking and that the neighbors might complain. I have no idea for the life of me why on earth he says that I am barking. I think I speak perfectly clearly thank you very much! “Oh my baby is going to look adorable.”, he says excitedly to Jaymi who has just come in with a tin of dog food in his hand. Oh and that dog food looks rather adorable itself. “Yeah she is. 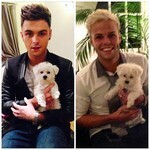 She’s going to look like a dog version of Beyonce.”, Jaymi smiles. I’m just glad he didn’t say Lady Gaga. I’m a bit reserved in matters of hair and style. But my dear friend Bey I can take. Not that I have ever met her but I like to pretend we’re besties going shopping and sharing make-up and gossiping about this and that. Oh my days! Aren’t daydreams just the best? I smile to myself as I think of this. “Did that dog just smile?”, Jaymi asks. Oh I have been noticed! A leap forward in communication coming to this festive period. “I don’t think so. Long day’s rehearsals?”, Olly smiles. No, no, no! I smiled! For crying out loud I smiled! “Must be. I could have swore that … It was a long day, yeah. I’ll just go and get this ready for Belle.”, he says indicating to the dog food tin with a gentle movement of his head. “Cool. I’ll have her ready in time for her dinner.”, Olly replies snipping another piece from the side of my coat. Jaymi goes into the kitchen and I can hear the clatter of the can opener hit against the dog food tin. “What did you get her?”, Olly calls. “Um …”, Jaymi begins clearly checking what the dog food is. “He was looking at the label.”, he whispers to me. I know but rabbit sounds divine. A little gravy on the side with a few slices of ham. Oh glorious! I’m not barking! I am simply asking for a mirror! Jaymi comes back in with my meat in my dog bowl. “Oh someone doesn’t like what you’ve done with their hair!”, Jaymi jokes. No, no, it’s not that. I just need a mirror. Olly lifts me down off the chair and Jaymi puts the dog bowl beside me. “Eat up there Belle.”, Jaymi says. Eat?! Are you serious?! Yes I’m hungry and that meat looks to die for but really?! I haven’t checked my new hair yet! “She’s been barking a bit today.”, Olly says. Yes, of course! I like to see what I look like! But nobody is forthcoming with a mirror and I sigh deeply before beginning to eat my dinner. As I made my way around the backstage area minding my own business I was confronted by Lola who I had not met before. “Hey you!”, she said quite roughly. I must admit to been quite taken aback but I kept my composure. I didn’t like to point out that she wasn’t too tall herself! “Hey small fry, I’m still talking to you. Realisation is slowly dawning on me. She has stormed off in a little huff before I can say that nothing has happened between Arthur and I and despite him been a devilishly handsome dog I don’t feel that way about him. I lie on the sofa by the CD player listening to Do They Know It’s Christmas and singing along while thinking what a fabulous Christmas Day this is. I managed to finally catch a reflection of my appearance in the back of the CD. My new stop gap mirror. And I was chuffed to bits I must say. Now what else would make this Christmas Day all the more relaxing. Mmmm. That glass looks rather appealing. It’s a brown liquid which I heard was called lager by Jaymi earlier. I feel a bit offended that I haven’t been offered any. Not that I have not been spoiled with various pieces of ham, chicken and of course the traditional turkey but I haven’t been offered even a sip of that liquid. As I try to formulate a plan to earn myself a drop of the drink my secret mobile phone which was given to me by a fellow Maltese pup and friend Chip for Christmas last year and which I hid in my coat because people are still funny about dogs with mobiles. The world has not realised our level of intelligence yet so we must wait. I waddle to the kitchen and answer the call. My neaves and confusion at Lola’s call are colliding together. Because I certainly didn’t give it to you! Arthur?! Why on earth would Arthur do something like that?! Oh no, he’s one of these dogs who like to have the ladies fighting over him! I should have known! Maybe I have Arthur wrong. He seems to have been charitable enough to defend me against these slurs of trying to take one’s dog. Yes I have been nothing but honourable, me. Boxing Day could have had a whole other meaning before the phone call! I end the call, place my mobile phone back within my hair and go back into the living-room. Jaymi and Olly are cuddled up on the sofa with that enticing liquid. I hop up beside them playing the sweet dog but I know what my goal is. Before Christmas Day is finished for another whole year I will make sure to get my paws on one of those glasses! Union J Admit That They Would Say Yes To Been X Factor Judges! Union J have revealed that they would be interested in becoming judges on next year’s The X Factor if they were asked to be. In an interview with OK! Online, band member George Shelley also revealed that he felt that huge changes needed to occur with the show next year. “I think it needs a massive change next year. The new judge needs to be so ridiculously huge and newsworthy that it will make the show exciting again,” the singer said. I personally would love that and if by some miracle I made the cut at the auditions I would love to have one of the Union J lads as my mentor or Louis of course! Abbey Clancy Wins Scrictly Come Dancing Final! The final of BBC’s Scrictly Come Dancing was tonight and it was the first ever all-female final. Woman power! The winner was Liverpool model Abbey Clancy after she fought off stiff competition from BBC Breakfast presenter Susanna Reid, former Corrie actress Natalie Gumede and singer Sophie Ellis-Bextor. Her daughter Sophia came with Clancy to the set during rehearsals and after her win she said her little girl would be “so happy” with the glitterball trophy. When the cameras had stopped rolling, Clancy ran and jumped into the arms of her husband, Stoke City footballer Peter Crouch. Aw!